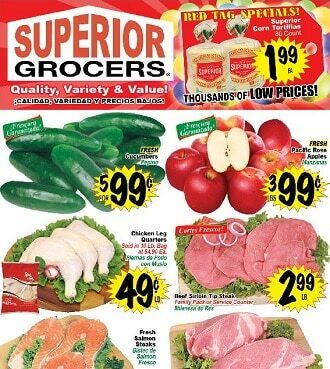 Here is the Superior Grocers Weekly Ad, valid April 17 – April 23, 2019. Don’t miss the Superior Grocers Ad Specials, coupons and grocery deals from the current Ad Circular. Start saving and get low prices for Fresh Chicken, Premium Fish Fillets, Ice Creams, Corn Tortillas, Best Foods Mayonnaise, Colgate Toothpaste, Cookware Sets, Minute Maid Orange Juice, Coca-Cola products, Roma Tomatoes, Jamestown Smoked Portion Ham, Pineapples, Suavitel Fabric Softener, Challenge Butter, Juanita’s Nacho Cheese.